. :: One Year Until FEI World Equestrian Games™ Starts in North Carolina, USA ::. The one year to go countdown to the FEI World Equestrian Games™ Tryon 2018 (WEG) was launched today. With more than 500,000 people expected to attend the 2018 Games, the 12-day spectacle of equestrian champions is one of the biggest events on the global sporting calendar and will be the largest equestrian event in North Carolina's history. Mark Bellissimo, CEO of host venue Tryon International Equestrian Center (TIEC) in Tryon, NC, announced today that tickets will go on sale to the public on Monday, October 16, 2017. Competition action at WEG 2018 runs from September 12 through September 23, 2018, with the Opening Ceremony scheduled for September 11. In addition to announcing ticket sales, TIEC has today released a "Destination Tryon" video to showcase the region where the 2018 Games will be held. Prior to winning the bid to host WEG 2018, Polk County, North Carolina dwelt as a hidden gem, tucked away in the bucolic Blue Ridge Foothills, bordering South Carolina. Surrounded by bold mountains and scenic foothills, the area is conveniently located within an hour of top cities including Asheville and Charlotte in North Carolina and Greenville in South Carolina. The rural community now joins the league of iconic destinations around the world - like Normandy, Stockholm, Rome and Aachen - to host equestrian sport's most distinguished championships. "All of our nations were discovered on the back of a horse and these amazing animals continue to provide livelihood, transportation, security, entertainment, friendship, therapy, and sport around the world. The love of the horse is universal and profound. The Games is an incredible stage to show the world how important and valuable this creature is and celebrate our relationship with them," said Bellissimo. 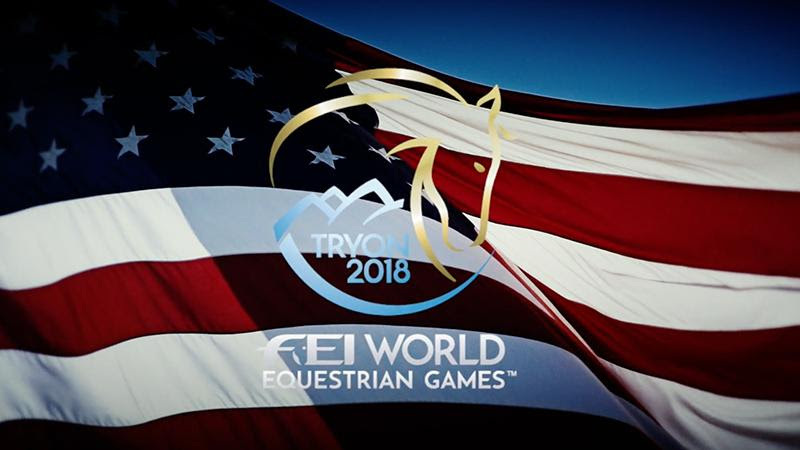 "Marking one year to go to the FEI World Equestrian Games is always a very exciting time and we're really looking forward to the spectacular event that Tryon will bring," Ingmar De Vos said. "The Games are the greatest gathering of the best athletes and horses from across the globe and hundreds of thousands of people will have the opportunity to enjoy the magic of equestrian sport as world champions are crowned across the eight FEI disciplines. The USA is renowned as a country of horse lovers and is also hugely successful in the sport so we are delighted to have this, the FEI's flagship event, back in America once again." "We are confident that Mark Bellissimo and his team at Tryon will host an exceptional World Equestrian Games next year. Having the Games in the U.S. gives us an opportunity to celebrate the joy of horse sports with millions of Americans in a way that will help grow engagement and participation in all equestrian sports in this country." said Murray Kessler, President U.S. Equestrian. The Games are expected to have tremendous economic impact to both Western North Carolina and the South Carolina Upstate. The previous WEG held in Normandy (FRA) in 2014 had an estimated economic impact of $400 million and attracted 575,000 spectators. North Carolina Governor Roy Cooper praised the organizers' success in bringing the Games to the Carolinas. "The World Equestrian Games are an incredible opportunity for North Carolina, and we are pleased to host this event in our state," said Governor Cooper. "We applaud the efforts of Mark Bellissimo and the organizers at Tryon International Equestrian Center to bring this global event to North Carolina and stimulate tremendous economic growth for our state as a result." Held every four years alternating with the Olympic Games, the FEI World Equestrian GamesTMcombines the world championships for jumping, dressage and para-dressage, eventing, driving, reining, vaulting and endurance into one massive 12-day event.